Cans are in great condition with good seals and minor scratches. Some have military markings that have been spray painted over at the Lake City plant prior to shipping out. Very nicely maintained Lake City ammunition cans that are in the 50 cal. size. 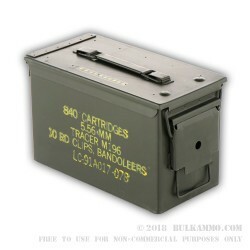 These are premium used (Like New) ammo cans that will easily serve you for many years if kept in normal conditions. The size is perfect for use in normal range trips or for long term storage of ammunition or other accessories that need moisture protection and a durable outer protective shell. 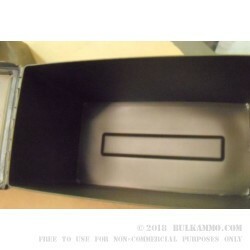 This is a standard .50 Caliber steel ammo box made to military specification and built for long-lasting durability. The design is proven over many decades of hard use in the field by military personnel and by shooters in the civilian sector. This is a premium example and is marked as Lake City in most cases, though all of the boxes in this SKU are Lake City cans. These will easily fit ammunition, accessories and small or medium sized handguns for an all-in-one range accessory box that has impressive weight carrying capacity and durability. It can also fit larger handguns if positioned properly. 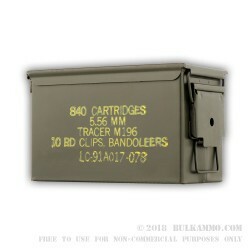 The ability to lock the ammunition can and the robust build quality of the carrying handle as well as the weathertight/moisture proof sealing capacity means this is one of the best long-term storage containers for the money that is built for ammunition and is sized for stacking and bulk storage capabilities.